Explore new powers and new lands in Drinkbox Studios' follow-up to the critically acclaimed Guacamelee! Jump into the sequel to the award-winning, Mexican-themed platform-action game, Guacamelee!. 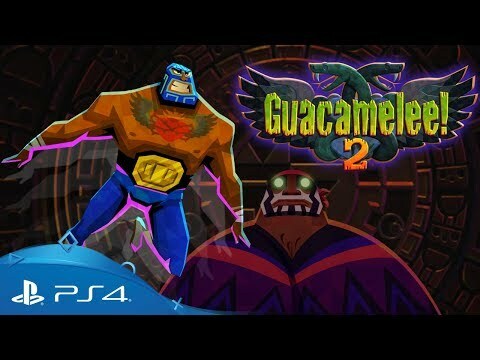 Set seven years after the events of the original game, Guacamelee! 2 finds Juan Aguacate living a happy life with his family, when his friend and trainer Uay Chivo discovers a new evil menace that threatens to destroy not only Mexico, but time and space itself. Building on the much-loved features of the original, Guacamelee! 2 returns players to Drinkbox Studios' uniquely styled world with a whole host of brand new player abilities, fighting moves and multi-dimensional platforming puzzles. Amazing new player abilities: Eagle Boost, Chicken Glide, and many more! Get fully up-to-date with Guacamelee! Super Turbo Chamionship Edition on PS4, complete with all the original DLC and added four-player co-op mode. Follow superhuman luchadore Juan as he journeys through the land of both the living and the dead in a quest to rescue the president's daughter! Re-unite with your favourite marsupial and re-live three legendary adventures, rebuilt for PS4. Jump into an action-packed platforming adventure sequel, full of family fun – exclusive to PS4. Nothing can prepare you for a plucky chameleon and wisecracking bat’s adventures in this classic style open-world platformer on PS4.